More than 10 years ago, Dr. Joseph Stookey, a professor from the University of Saskatchewan Western College of Veterinary Medicine wrote a very good article addressing the issue of dehorning from an animal welfare perspective. This was before the era of back-to-back national food recalls, hidden-camera farm exposes, and an unprecedented surge of activism in animal welfare and food safety. We thought it might be worth revisiting this article today to see how the industry has changed over the intervening decade – and how it hasn’t. Dr. Stookey was certainly ahead of his time in recommending early-age disbudding from an animal welfare perspective. And although the use of polled genetics has increased in the dairy industry, the availability of quality polled dairy bulls remains very limited. But over the last decade, research has shown that when it comes dehorning and pain, the right procedure – and the age of the animal -- does indeed make a difference. What do you think of Dr. Stookey’s article? We sometimes use the word “humane” to describe caustic paste disbudding in comparison to other, invasive methods of horn removal. Humane is not a synonym for painless, as all dehorning methods are painful. Rather, we use it to describe a procedure that’s been scientifically demonstrated to be less painful and distressful to the animal than other methods. Caustic paste disbudding is both effective and a more humane way to dehorn. For producers who pride themselves on their animal handling practices, paste disbudding is clearly the more humane choice. Do you agree that paste disbudding is more humane? 2008 seemed to be a banner year for dehorning research. 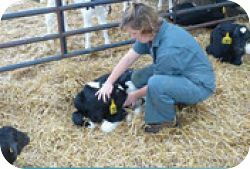 That was the year we saw the publication of articles on everything from dairy calf welfare to the comparison of pain response in calves receiving hot-iron or caustic paste. That same year, the Journal of Dairy Science published an article, co-authored by Dr. Temple Grandin, highlighting results from a survey 113 dairy farms, showing only about a third of calves are dehorned by eight weeks, and about 80 percent are dehorned with a hot-iron. Aside from a survey published a year ago showing 90 percent of U.S. bovine practitioners dehorn at the time of castration, there hasn’t been a lot of new data recently. Some interesting dehorning data came out of Europe last fall, but that’s a subject for another blog. A survey of consumer attitudes toward various dehorning methods. What kind of dehorning data would you like to see?